Why ISVs and Enterprises Install Jelastic Private Cloud PaaS? Why ISVs and Enterprises Install Jelastic Private Cloud PaaS for Internal Development? Recently we’ve highlighted the reasons why Jelastic Public Cloud is chosen by developers worldwide. And today, based on the feedback of our Private Cloud customers, we’d like to summarize what exactly attracts ISVs and enterprises in our platform and what benefits persuade them to install Jelastic PaaS on premise for their internal needs. “Control over our environment, not limited like other PaaS. Besides, Jelastic is easy to use, setup and maintain,” Kerby Arion Martino, Dotweblabs. “I can focus on development and the tasks of the company. 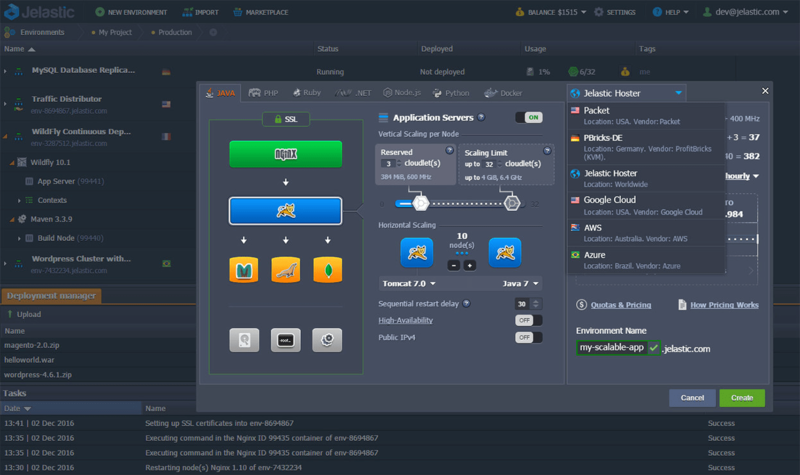 Hosting, scaling, and management of the whole application stack are easy with Jelastic and I save a lot of time,” Falk Wolsky, Mapegy. “The integration of our development tools with Jelastic platform gives us a quantum leap in the improvement of safety related processes and software quality,” Miguel Hormigo, GMV Secure e-Solutions. “The main benefit for us is that the applications are no longer sharing the same resources, one site getting hammered no longer slows down everything else. Also earlier we’d have to pay for a pretty beefy server to be able to handle the big loads, now we just go in, pull a slider to set scaling limits and don’t worry about performance,” Fredrik Larsson, Dempsey. There is a possibility to mix and match different infrastructure and cloud offerings within one cluster. Jelastic is compatible with different Cloud IaaS solutions (as Azure, IBM Cloud, AWS) or can be installed on bare metal. So if required, the private cloud installation can be easily extended with external resources that are going to be managed within a single panel. “Support is very fast and solves any problem within a short period of time. The positive experience with Jelastic support was one of the most important decision-making points for choosing Jelastic as a PaaS for our Application platform,” Falk Wolsky, Mapegy. Ready to try Jelastic Private Cloud Platform for your application? Contact us providing details about your project and we’ll offer you the most suitable cloud option.